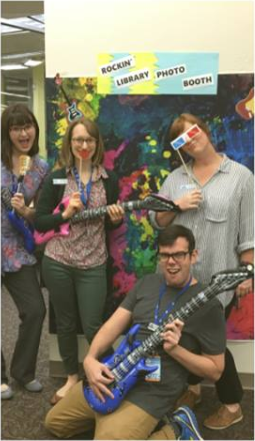 In the summer, our library team had created a small photo booth with some props related to the Summer Reading Theme: Libraries Rock! We had it semi-close to our display area that had a rotation of books related to the theme as well. The engagement with the props and book display were shockingly high! Kids loved playing on the air guitars and families asked library staff to take their picture. When summer was over, we packed it up, but still had families asking us when and what would be the next photo booth. Interactive displays that correlate with a book display can help all library users connect library materials with fun activities, or visually help them reflect on a topic. An interactive display, whether this is a photo booth or activity, can start conversations with patrons and staff. At our library, the library displays also became an extension of our children’s area. The children had new toys and materials that encouraged them to engage in pretend play. After they experienced being a “rocker” with our “Rockin’ Library Photo Booth,” families were able to take home related library materials about music. The photo booth also encouraged patrons to post their photos on social media, starting conversations in the cyber world about the benefits of the library. After the “Rockin’ Library Photo Booth,” we did a pirate photo booth with a pirate book display for “Talk Like a Pirate Day!” The photo booth had pirate props for patrons to use and patrons could also engage in adding their pirate name to the wall based on a pirate name generator that we posted. This gave us not only the opportunity to showcase our collection related to pirate materials, but also our subscription to Mango Languages that has “Pirate” as a language to learn. Shortly after “Talk Like a Pirate Day,” we did a Banned Books Photo Booth and book display. Patrons of all ages enjoyed our Banned Books Photo Booth. We created a space for patrons to create a booking photo with a favorite banned book. It sparked much conversation about the freedom to read and we were re-filling our banned books display often. Although we didn’t have any complaints about this display, we decided that next year we would forego the “prison” theme for banned books, as this for some families might not be playful imagery, but instead might bring up painful memories. For October we did a “Today I am a….” and included some recycled costumes we had for patrons to use. Children could be anything from a fairy to a firefighter, or even a combination of the two! Children (and even some teens) engaged in play around the library while adults engaged in a book display about costumes to help inspire them for the Halloween season. A Voter’s Registration Display with not only information for adults, but also a space for kids to make their own voter’s registration card to take home. A “Vote for your Favorite Book Bestie” to celebrate National Friends of the Library Week. A thankful tree for patrons to share what they are thankful for this season. Whether it is a photo booth or an activity, I highly recommend using interactive displays connected to book displays to help spark conversation and interest in library materials. How do YOU use interactive displays at your library? Let us know in the comments below. 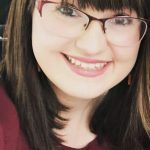 Today’s guest blogger is Aileen (Allie) Barton. Allie is a children’s librarian at the Belle Isle Library in Metropolitan Library System in Oklahoma City. She loves planning programs for elementary students and learning more about how to be an effective children’s librarian. Banned Books Photo Booth is a wonderful idea! I understand that you have chosen to avoid the “prison” theme, but you can still convey that blocking access to books is an attempt, one we hope will be unsuccessful, to imprison people’s minds.